You cant go wrong with these tires. ive only done a few hundred miles on them but they feel great on my vstrom 650. They handles twisties very well and have plenty of grip. They look really nice too. Not the greatest tire in the mud but this expected as a 80/20 tire. These tires feel much better than the stock tires that came on my bike. The 705 has been great on my Tiger 800XCx. From Oklahoma to Big Bend TX. Yes I did River Road on it. Spent many weekends in the Arkansas Ozarks, both paved and dirt roads. This tire mounted up flawlessly and is way better than the big name tire it replaced which cost a lot more money.Handles great on all surfaces even at high speed (80-90+MPH) on the highway. Dont buy anything else for your dual purpose adventure bike. Good tire. When I bought my bike there was a new set on. Front is still good and replacing the rear with 4000 miles. It still has tread left but I am going on a trip. Great tire at great price. I've had about 4 so far on my 2014 V-Strom 1000. Excellent gravel road traction, and good performance on pavement. I average 4 to 5000 miles Life out of them. For the price I think they are a great value. I run the set on my DL1000 Vstrom. Great tire for the kind of riding I do. I've been fairly impressed with how aggressive this tire lets me ride. It can tackle most trails but it sacrifices the speed my TKC80s allowed. I get maybe 5000 on rear and have yet to replace the front. I run dyna beads in mine and its worked out well so far! THESE SHINKO TIRES WORK OUTSTANDING ON MY TRIUMPH TIGER 800 .EXCELLENT VALUE AND HANDLING AND SERVICE..WORK GREAT ON FIREROADS AND MILD OFF ROADING. I'm on my third set of Shinko 705R's and I've been very happy with them. They grip well in the dry and the wet, and they handle gravel and light mud well. On my 650 V-Strom, they howl a little right at 45mph, but it's not obnoxious and it goes away before 50mph. I definitely recommend them to anyone on a mid-weight motorcycle, who wants to do light-duty dirt. Decent tread depth and pattern. While not a true dirt tire, it looks more meaty in person then expected. Good grip on dirt/gravel roads and does fine on the road. Considering the price, I would not hesitate to buy it again. I like them so far. Too early to tell tread life. Performance is good though. been through 4 of these already. solid tire. fair life (depends on your riding style and location). overall good choice. 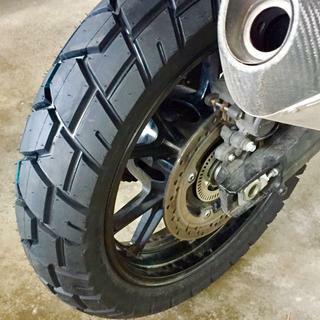 2013 BMW GSA..... very good tire for the price. dry/wet handling about average on a fully loaded GSA. Off road capabilities are awful. . slightly better than a strictly road tire..only disappointment was the longevity. . @5000 miles.. but for the price.. can't be beat..
New season, new tire. I mounted the Shinko 705 on my BMW R1200 GS and put 230 miles on it. About 60 miles asphalt and the other 150 was woods, power lines, stream crossings and dirt roads. Very comfortable and good bite off road considering the heavy bike - fully loaded panniers and powerful bike. I was expecting some noise and vibration on the hard pack but can't say that I noticed any. Rocky Mountain is a great shop and shipped the tire immediately. Very pleased with the shop and the product. This is my second set of Shinko 705 on my KLR 650 got over 7000 miles on the rear tire. Great price. Shipped out right away. I'm very very impressed with this tire. I can't believe the quality for the price. I had Anakee 3 before, Torrence and Battelwings. These are not as smooth but not much worse. These corner well and ride highway well. Dirt roads no issue. I do 95% roads and could be fine using these especially for the price. I will probably go back to the Battlewings but maybe not. Never go back to Annakee's cup too much, especially for the price. Torrence didn't like period. Batt wing wore well cornered well and fair price. But might just stay with the Shinko's. this is a good tire for my KLR650 because most of my current riding is street. These are not really good in soft sand. You can't beat the price although you may get better mileage out of a more expensive tire. Good tire fo the money. I have been running these tires on my V Strom for 40,000 miles and averaging 5,000 mi on the rear and about10,00 on the front. I have installed a set on my Tiger 1200 and my wife's NC 700x. For the riding we do the tires have worked great fire roads and single track jeep roads. Garbage quality tire, with a little over 5000kms on a set the rear has to be replaced already.The scariest thing about the rear tire was the severe tread seperation at over 12 different locations. I've run this tire for about 5 years now on both a Suzuki V-Strom 1000 and now KTM 1190 Adventure. They handle road and off road very well. It performs as well as OEM Conti's on road (although doesn't last as long) and outperforms them off road by a large margin. I've used them in deep desert sand (AZ, UT) and GA double track and milder single track. They do really well in anything but GA clay. I'm now running the new 170 size on my 1190 and just as impressed with it. I had a 150 on the 1190 for 3500 miles and it did fine too but the 170 transitions better on road. People tend to get 5000+ miles out of these but I'm hard on tires and haven't ever got more than 3500 but that's still good value. I may try the MotoZ Tractionator Adventure next but they're expensive. So, on my KLR650 in LA, about to ride back home to Ohio. Looking all over for another set of Heidenau K60 tires, but couldn't find any in stick. Ehh, I guess these Shinkos will get me home, at at 1/3 the price, not to bad to wear them out so quick... WELL NOW... 8,000 miles later, the front is what I'd call 50% worn and the rear is 85% worn. The handling on road is right there with the Heidenau and off road is darn near the same too. I got maybe 10,000 miles from the Heidenau rear, but for 3 times the cost! So, I'm very pleased that I ended up with these 705s. If I want a bit more dirt traction I may try the 804/805 next. All in all, they aren't just a good tire for the money, to me they were a great tire overall. I have used these tires both rear & fronts with great results, I do mostly road riding with a few dirt or gravel roads , I average between 5000-6000 miles on rear tire & maybe a bit more on the front, depending on the length of my ride when its getting low on tread. When you consider the price of these at R M its hard to spend more money on expensive tires & probably not get any better wear. I was aware of the 705 before I bought it from Rocky Mountain (RM), but what clinched it for me was the great video support they offer for most of their stock. The videos keep your attention, not slow or boring, very professional and not some guy talking a mile a minute to try and impress. Your videos and reviews on the Shinko 705, made selecting it easy. I just bought my bike a few weeks ago, and like all things I do I started collecting accounts to make selection and buying an ease, but after reviewing 6 other parts providers, RM has them all beat. The prices are so much lower than their competitors. Thanks for making a website that is so user friendly, and having the since to keep track of my machine. Installed a pair of 705's on my R 1200 GSA the break in time is fairly long almost 200 miles before they felt comfortable but after that they ride good on dirt roads and on the interstate also grippy in the rain . With 5,500 miles the front looks almost new the rear should last another 1,000 . But at the price about 1/2 of others who could complain . I'll keep buying for sure! I have had Pirelli MT90 AT Tires as well as a rear Heidenau K60 on this bike. I wanted to try the 705's as I used 009 Raven Shinko tires on my Triumph Tiger 1050 and the 705's on my 98 Tiger 900 in the past. Observation: the Pirelli tires are almost close cousin to the 705's but cost much more and may have a deeper tread. Conclusion: I prefer the Shinko's they hold to dirt much better last just under the same miles as the MT90. Nice long life but to my they start feeling snotty wet or dry after 3k miles, at 5k I took them off. I prefer grip over long life any day, I blame the center solid strip on the K60's it is like a street tire with hard rubber. I get around 5.5k out of the 705 tire. The front tire should be called Shinko Howlers lots of noise but I use ear plugs after about 500 miles the do calm down a little. Dang good tire can hold a load as well. I've had this tire on my bike for a while and have taken it offroad. I used to run 33psi but now run stock pressure because it's more comfortable both on and offroad. It works surprisingly well offroad. It runs a little warmer after riding on the freeway at stock pressure, but I haven't had any problems. I've taken a nail and a screw to the tire so far. The nail was about an inch into a shoulder tread block and didn't penetrate the tube, the screw went straight between the tread blocks and it was all over for the tube. Replaced the tube and all is well. I dont ride serious off road,but I do like to explore! Mostly on graded dirt roads in the desert some easy trails, I have a dirt bike for the hard stuff. These tires work great on the street and on wet pavement. They were less than half the price of the tires they replaced. The 150/70 worked great for me, comparing longevity to a PR3 I think this tire does well. I got around 6,000 miles compared to the PR3 getting about 8,500. Improves off-road fun and after a few hundred miles it feels fine on the road, but at first it feels knobby. Surprisingly good wet traction as well. Installed on an '05 VStrom 650. During the 285,000km I have logged on my Wee I have went through alot of tires. Mostly Battle Wings, with a sprinkling of Tourance's and Anakee's. There was little to differentiate between those tires, especially in feel/handling of the bike. Let me tell (warn?) you that right off the cuff you WILL feel a huge difference in the feel and handling of your ride with these tires. Now I'm not saying that this will end up being good or bad, these are my initial impression immediatly after installing and going for about a 50KM ride. The very first thing I thought was that the front tire had gone flat, it definatly provides a much heavier feel through the bars. Nope, checked the pressure and it was fine. Continue the ride. Cornering is a whole new experience, especially at lower speeds. It is though these tires are gluing themselves to the pavement, and the bike feels like it is "falling" into corners and then wants to immediatly sit up when you are finishing your corner. Out onto the highway, they do make some noise, a hum I have never noticed with the other tires I typically use, which at a 90/10 designation are pretty much a street bike tire. I did travel down a short dirt type road (not gravel) and I would have to say they are a big improvement over the other skins I have used. Having read other reviews, I was somewhat prepared for the difference in turning/cornering so I was not completely shocked. The front does feel out of balance with the rear (more traction front than rear) but I expect to get used to it. This is a meaty tire, no doubt. I do hope I can get close to the mileage I generally got with Battle Wing (average 12,000km) because the price is much easier to handle when you buy 3 rears and 2 fronts each year. I install my own tires, and these are noticably easier to spoon on. Time will tell how I end up liking the Shinko 705. Please note, I gave them a 3 star rating only because the review calls for a rating and I didnt want to put a poor or exceptional rating so early in the tires life. 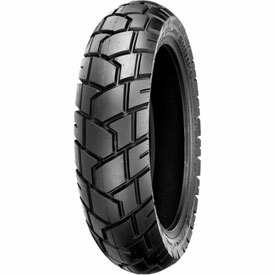 Great V-Strom tire at a great price. Just bought rear number four for my KLR... I've put nearly 50,000 miles on my 2011 since bought new in Nov. 11. After the oem needed replacement, I used the 705. Inexpensive, long lasting, and they just work. Not too spiffy in mud or wet grass, but they've brought me out of the mountains during a downpour, they've taken me through deep sand and across a river bottom, and continue to take me 110 miles a day to work and back. I have yet to get less than 10,000 miles on a rear... even went 30,000 on a front before replacing it. For the price... a fine tire... just stay out of the mud and off of the grass! 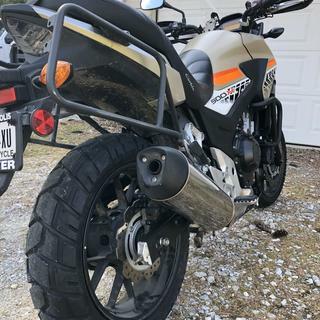 I have this tire on the back of my 650 VStrom, and I like it. It's more aggressive looking than the stock tire, but not too crazy. I bought a set of these for a 4,500km adventure ride from Adelaide to Canberra and back on my Honda NC700S. Approximately half was on sealed roads, 40% on formed dirt roads and 10% on dirt tracks and off-piste. The front was amazing - never once did I think it was about to let go. The rear though was pretty easy to step out of line, but probably more a reflection of the weight bias on the NC700S. They were great on high-speed dirt roads, but as expected, challenging in deep sand. On sealed roads they're quiet enough, and allowed me to drag the pegs through a brilliant 70km stretch of switchbacks. I'd rate these tyres 60/40 sealed/unsealed. They've now done 6,000km and the rear probably has another 1,500km in it till the wear bars. I expect the front will last two or three rear tyre changes. I purchased this tire in September for my Versys. So far I've put just under 3,000 miles on it and it's holding up really well. I've done some single-track, quiet a bit of dirt roads, and a lot of pavement and it handles it all really well. Will be buying this tire again when it's time for another. I have just fitted the Shinko's front and rear to my 06 DL1000. I have had Meltzer's mostly and I have found the Shinko's up there with them. They are great in the dirt as we get into the mountain on dirt roads and they have good feel on the bitumen. The only complaint is the front is a bit noisy, but I had a set of Pirelli's fitted a while back and they made noise too. Don't know what sort of distance I will get, but for the price, even shipped to Australia, you can't go wrong. Love this tire on pavement. I have put just over 3000 miles and still have lots of tread. I ride about 80 percent pavement 20 percent dirt. Smooth and very predictable on the road. Off road is another story, back tire is ok, lots of spin as would be expected, The front tire is scary off road, very unpredictable. Front end will wash out even at low speeds. It is fine on hard pack but not on any type of loose soil. I will be replacing the front before it wears out. I'm on my second rear and first front tire of this particular model, and I love them. They're great 80/20 tires, and since I commute on my bike, I appreciate the good tread life I get from them. I got around 4000 of almost all highway miles, and there was still probably another 500 left in it when I replaced it. When they're new, they work great for dirt roads and hard pack trails. Once you're in loose terrain like sand or mud, you'll want something with actual knobs on it, but as an all around tire, it's tough to beat these. I run Michelin tires on just about everything I own, so it was only natural to put Michelin Anakees on the Wee Strom when I bought it (used). Wasn't overly impressed. A friend suggested I try the Shinkos. They held up just as well, can drag the occasional peg (pretty impressive for dual sport tires) and were reasonably priced. I'm back for more. Even started using the 011 model on my FJR with good results. If I had to knit pick, it would be that they seem to harden up and lose a little traction as they age/wear. Seems to be easier to skid the rear tire when they've got some miles on them. But for the price, you can change them sooner then the brand name tires and stil come out ahead. My KLR650 came with one of these on the back. I've been amazed what it can do off road(snow, 6 inches of mud) and it's almost bald in the middle of the tread. Great on road also. The only time it's lost traction is wet clay or wet grass. (I've not tried one on the front or ridden in sand). It goes better than it stops in slick conditions. I was on the fence about this tire because of the horror stories regarding the old bias ply. I bought a front and rear set and was truly impressed. The front still looks new after 6500 miles and the rear is to the wear bars. These are just as good as the Conti road attacks I have been using and half the cost. I run these on my 1000 V-Strom with a lot of 2 up and heavily loaded. My rides include a lot of twisty curvies and plenty of dirt and gravel roads. They are FAR more confidence inspiring off road than the Contis and just as good on road. I just ordered another rear. 2 of my co-workers just put them on their KLR650's and like them far better than their deathwings that came stock. klr 650. yes or no from someone with experiance, do not tell me to look at fitment guide?? BEST ANSWER: Yes. The 705 is a great dual sport tire biased to the street. I'd call it a 80/20, maybe 70/30 tire. Has better off pavement characteristics than the typical Anakee or Trailwing. And these things are bargain priced.. If you want another bargain priced tire and will be doing more off pavement stuff look at the Shinko 804/805 pair in the big block knobby pattern. Way better off road, about equal to the ultra expensive Continental TKC80's, priced similar to the 705's, handle the pavement better than much more expensive DOT knobs (like TKC's) and they seem to wear no faster than the 705's. Only down side to the 80X tires is a little buzz on the tarmac. Doesn't bother me. The answer to your question is: it depends the use you make of it. On my 650 V-Strom, even in 2 up rides in all sorts of weather, black top or gravel roads this tire serves me well. Only cons are shorter thread life, I can't get more than 5k miles out of it, but on the flip side it cost about 1/2 of it's competitors. For optimal performance tires pressure needs to be adequate to predominant roads conditions, what works well on highways does not on dirt roads. 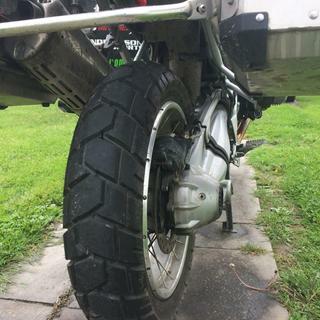 I have a KLR 2012 but when I purchased this tire and the matching front, when on a Triumph Tiger. Drove the bike with the rear tire on and was perfect but once the matching front was put on it drove like a truck and I would not recommend. Put about 5,000 miles on the bike and the tires did still look like new which is a plus but handling wise no good.. Good luck with the KLR. I am not sure what your question is. 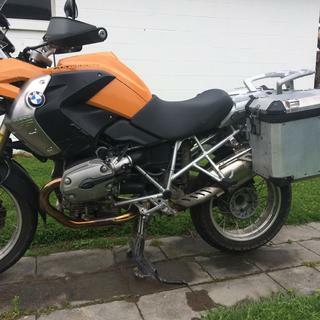 Will it fit a KLR? I don't know. If the size of your present tire matches the size that Shinko offers, it should fit. Yes or no to buy it? I am on my second Shinko 750. I ride a BMW R1150GS. If my second tire wears and handles as well as the first, I will buy a third. You can't beat the value. I use the 705's exclusively on my BMW R 1200 GS Adventure that I've ridden 80,000 miles and love them and they are so much easier on the wallet than any other tire on the market. The rears last me around 6,500 miles the fronts last 13,000 and I'm 6' 285 and ride the US every riding season so they get used quite hard. 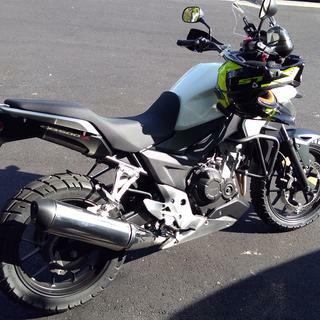 My wife and I have a Triumph Tiger 800XC each. I was due for a new rear so I bought 2 of these. I have fitted mine, and have done 5000km on it and it is wearing well. Very happy with the performance on road and in dirt. For the price ya can't go wrong. As it stands, if I was in need for a new rear I would buy again. They are great!! I have them on my supermoto set up. They are great on road for traction and confidence and can handle gravel and dirt no problem. Great tire for the price! HEck ya do it, front can be a little washy on gravel but it's a good tire at a good price and lasts a long time. I like the Kenda 270 for the KLR650 a little better than the Shinko 705. Kenda is a little more dirt worthy. Great tire for any DS bike. I run them regularly on my R12GSA and XR650R. Best bang for the buck!! Yes, I have had this tire for a year and its a great tire and a great value, Highly recommended. Great tire for street, pretty decent in the dirt too. It should last forever on your KLR. 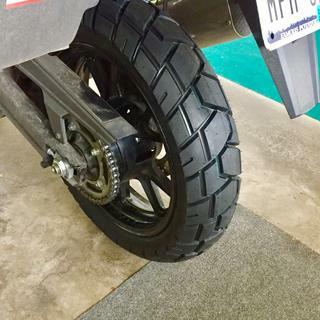 Great tire for the KLR.